The parish was in the Colsterworth sub-district of the Grantham Registration District. In an 1890 reorganisation, the parish was allocated to the Grantham South sub-district of the Grantham Registration District. Check our Census Resource page for county-wide resources. You can also perform a more selective search for churches in the North Witham area or see them printed on a map. The Anglican parish church is dedicated to Saint Mary the Virgin. There is some evidence that an Anglo-Saxon church existed on this site. The church is believed to have been built around 1086. The church tower and spire were built between 1380 and 1410. The church was partially restored in 1852, then more completely restored in 1887. Anglican parish registers exist from 1591. Boyd's marriage index covers the period from 1562 - 1837. The LFHS has published several indexes (marriage and burial) for the Beltisloe Deanery to make your search easier. Check our Church Records page for county-wide resources. In 1891, the district was reorganized and the parish was in the Grantham South sub-district of the Grantham Registration District. Check our Civil Registration page for sources and background on Civil Registration which began in July, 1837. 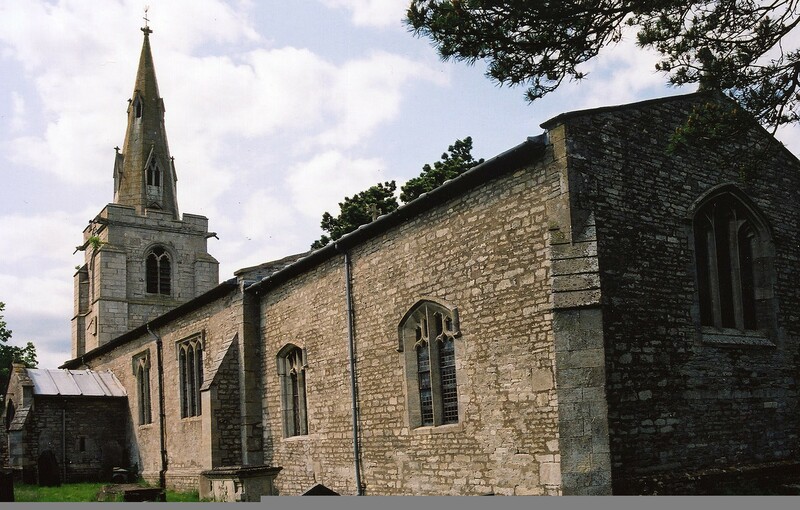 North Witham is both a village and parish on the River Witham 9 miles south of Grantham and 12 miles north-west of Stamford. The river flows north at this point, toward neighboring Colsterworth parish. Gunby parish lies to the west. The parish covers just over 2,430 acres and includes the hamlet of Lobthorpe. The parish includes a portion of Twyford Wood, a dense forested area that extends into Colsterworth parish. Tim HEATON has a photograph of North Witham on Geo-graph, taken in 2005. Visit our touring page for more sources. Ask for a calculation of the distance from North Witham to another place. You can see the administrative areas in which North Witham has been placed at times in the past. Select one to see a link to a map of that particular area. Joseph MARSHALL was born circa 1826 in Auborn, Lincolnshire. The village had a large inn and posting house (Black Bull) on the Great North Road (Ermine Street, also Lobthorpe Lane locally). The Inn dates from the 1730s but was closed by 1900. The building is now a Grade II structure with British Heritage. Recent reports have it that the Black Bull has reopened, although its reputation was stained by a recent drug bust of a cannibis growing effort by two tenants in 2011. Tim HEATON has a photograph of the Blcak Bull Inn on Geo-graph, taken in 2005. See our Maps page for additional resources. In 1942 the dense woodland of Twyford Wood was surveyed for possible airfield use. The Air Ministry requisitioned the site from the Forestry Commission. The airfield was laid out in the normal A pattern and sites for parking 50 bombers were laid out. Because of the growth of US involvement in the air war, the airfield was destined to have a long career with the USAAF. It became a USAAF active station in December 1943. RAF North Witham became a Pathfinder School in March 1944 and stayed under that role until September 1944. In June 1945 North WItham airfield was returned to the RAF, but the airfield was already in a "care and maintenance" status. It started a new life as an equipment spares depot in July. RAF North Witham was finally closed in 1956 and then was sold off by February 1960. The forestry Commision regained the site and replanted it with trees. At last report the control tower and one hangar remained, as well as the old runways. Tim HEATON has a photograph of a Pillbox from WW II on Geo-graph, taken in 2005. There is a marble and alabaster tablet in the parish church to those who fell in World War I.
Witham is from the Celtic or pre-Celtic river name of uncertain origin, and the name appeared as Widme in the 1086 Domesday Book. This place was an ancient parish in Lincoln county and became a modern Civil Parish when those were established. The parish was in the ancient Betisloe Wapentake in the South Kesteven district and parts of Kesteven. For today's local governance, the Parish Council was merged with that of nearby Colsterworth in 2007. For today's district local governance, contact the South Kesteven District Council. The poor of the parish had a yearly rent-charge of £1 out of land at Ufford left by Ruth EDGE in 1717. The poor of the parish also the dividends from £122 and 2 shillings out of bequests by Sir. B. SHERARD and four other donors. As a result of the Poor Law Amendment Act reforms of 1834, the parish became part of the Grantham Poor Law Union. Bastardy cases would be heard in the Spitalgate (Grantham) petty session hearings. A public elementary school was built here in 1872 to hold 41 children. In 1941, at 3AM on Good Friday, a German bomb destroyed the old National School building, which was empty at the time. It is believed that the German pilot thought he was over Grantham when he released his bombs. No one was killed. The school was never rebuilt. See our Schools page for more information on researching school records.